Well, Form 2 started! I need to go back to the good old (not long ago actually) scout Saturdays. If my memory serves me correctly, our scout meetings had been changed to all Saturdays starting this year instead of the normal 2nd ,4th and 5th Saturdays as we don’t have enough time to run our activities. 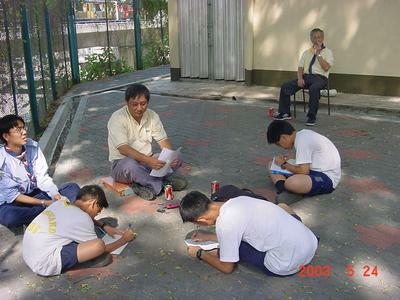 The year was 2003 where all our activities start to form when Mr. Yeo Eng Kang (got his surname from Au Yong Min Hao, thanks) left the troop to further his studies (as said by Mr Wan Heng Yuen) and the troop was left to be run by Mr Gary Lee Chuen Inn (indicated by “Gary” as his name is very long) and Mr Choo Yew Kuen (indicated by “Choo”). As innocent as a baby, I was left to confusion as it was only my second year in scouts. Gary taught us many scouting skills although he was busy almost every week. He sacrificed his working time (sometimes, maybe) to come to the meetings. And if I am not mistaken (my memory serves me not so well), Choo takes care of our meetings when Gary was not here. Or maybe it’s Mr Liu Kwai Choong, not really sure as it’s quite a few years ago and now that I’m really quite close to them. He (or they) mainly guide and teach us through our activities as we were the new batch of scout leaders in our year and for years to come). The senior scouts were guided and taught by Mr Wan Heng Yuen. In this year, I can finally have my first ever camp (out of the house). I have forgotten the exact date (you can refer to Au Yong Min Hao’s blog). I think was a Friday though. I was made to carry my scout things to school as my parents aren’t free. After school, we boy scouts had to go assemble quickly near the podium to set up our tents as it is getting dark. As it was my first ever time erecting a (dome) tent, things gets a bit messy. And mind the sky, it was getting so dark that it was almost pitch black at the (that) moment. We had to rely on our torches. We got scolding as the process is slow and it made our later on agendas to be postponed longer. We got to make sure the pegs are stuck in the ground, securing our dome tents and the fly sheets. By the time we finally finish our excruciating time of that day pitching up the tents and putting our stuffs in it, it was already 2000 hours. I can still remember the glimpse of KL Tower, glowing and partly shining our path in the school field. At the time too, most of the buildings in KL had lighten up the was-pitch-black dark sky, as if heaven in school, the view and scenery was nice and memorable. Funnily enough, I forgot how we get our dinner that day and what we ate. I guess I need to rely on Au Yong Min Hao’s details to remember the exact details. However I guess it was cooked by centralized cooking by the seniors as they were there. But I remember a few things more, that is that day, we got our singing sessions with the old boys (scouts) for the first time. At that day, almost 20 of us got the first hand chance to learn the songs that they usually sing during their times in scouting and we got to listen to their yarns (real stories from real experiences) about their time in scouting. They taught us and told us that the normal luggage is not a good choice for a haversack and also we need to buy the normal billycan (or any mesh kit) to use it as plates as it can be doubled as a pot or pan to cook our simple meals (though at first, I thought it was the normal plates used by prisoners in movies, ha ha). At the field, we learned a few “Fred’s philosophy” such as ‘sneak but don’t get caught’ and ‘they suffer but they enjoy it’ (the first sentence’s is in our mind, not really polite to recite it aloud though). But seriously he taught us quite a lot. We have divided ourselves into our temporary patrols in order to work in teams (or patrols). We did our things in patrols form. We sang songs in patrols. We even had a chance to meet Mr. Yeo Eng Kang again, as he had left the troop to further his studies. We were introduced to many old boys, who wanted (and actually did) to tell us ghost stories of the school. Some of us like me (at that time) was not so keen on it and did actually have a bit of frighten of it although the night was bright. I can’t recall the stories and yarns that were told anyway. Well, then our bed time was near and they stopped the yarns and the (ghost) stories (thank god…). We got a bit excited, you know, as it’s the first time I (and many a few more) camp outside of our house. And frankly speaking I slept actually for a few hours and many who did not sleep (e.g. Au Yong Min Hao, you can read his own experience yourselves) had their times with the seniors there. Then, the morning call awoke us all. We prepared our breakfast, refreshed ourselves and prepared ourselves for the coming meeting to start. As many fellow scouts did not attend the earlier night meeting, they were amazed by the tents that we had erected. Then Gary explained a few things about camping and a few details that we should be aware of during camps (and the camp last night). Then, as usual we played our games and cooked our lunch in school and to prepare for the PL selection ‘exam’. Unfortunately, many who were waiting for so long gave up and left the school. It was then left with Au Yong Min Hao, Wong Kuan Jhun, Chin Seong Bin, Choy Weng Hoe, Kenneth Yeo, Law Wai Kar, Siow Cheng Yiap, Sean Ong and I. The 9 of us continued our exams. There were a few examiners to see if we were up and fit to be a PL or a PS. I still can recall the first exam I took though I forgot who I took it with – we were separated into groups of 3 – that is with Charlie Ng who asked us a few questions about why we want to be scouts such as who should be in front of the patrol (PS) and who should always walk the last in a patrol (PL) and state why. Then we proceed into the Kim’s game by Choo, who was then gave us a few minutes to ask us to remember and recall back the things that were on the piece of cloth. But I couldn’t recall the last game by Gary (or was it Kwai Choong). The groups were required to take turns to take the test by each examiner within a limited amount of time. At last, we finished our tests and were given a break time for us to rest a while, while the examiners mark and gave points to our exams. First, the examiners told us where we did wrong and asked us to not repeat the mistakes again. I can only remember what Choo said in our performance in the Kim’s game. He said we can actually work as a team to remember the things in the piece of cloth and make up a story to link the things we were suppose to remember (I hated myself for that as I did not us the team tactic as we thought it was a solo exam). In the end, Gary announced the top six scorers who will be selected as PL’s and the remaining 3 as PS’s. The new patrols were Eagle: Chin Seong Bin (PL) and Tai Weinan (PS) (sobs…); Falcon: Choy Weng Hoe (PL); Gannet: Wong Kuan Jhun; Hawk: Kenneth Yeo (PL) and Siow Cheng Yiap (PS); Merlin: Law Wai Kar (PL); and Swift: Au Yong Min Hao (PL) and Sean Ong (PS). In the end, they all left the place at around 5pm that day (or later). Well, congratulations and good luck, you guys!!! Tenth KL, Tenth KL, UP! UP! UP! so why not Au Yong Min Hao? Just wonder if you are the Scout i met in Chin Woo who explained to me about Air Scout as we do not have Air Scout in Penang? I didn’t know you checked the internet. I think I am that same Weinan who explained to you about air scouting that day. Yes, Mock is still in the school, helping out as Assistant Scout Leader for the Senior Troop and Assistant Rover Mate. Feel free to contact him or just drop by the school every Saturday, at from 9am-12pm, for our weekly meetings, as I’m not currently in Malaysia right now.